The story of The Comet is Coming is the stuff of dreams for aspiring bands: a serendipitous meeting of musical minds and an album, thrown together out of sheer enthusiasm and a series of creative epiphanies, that propelled the East London-based group into the national spotlight. Last weekend the cosmic jazz trio, fronted by charismatic sax-player Shabaka Hutchings (aka King Shabaka), played a headline set to a delighted crowd at a rain-soaked Chatsworth Road festival. Tonight, the group’s debut album Channel the Spirits will be up against the likes of David Bowie and Radiohead for the coveted Mercury Prize. Max Hallett (aka Betamax Killer) is the group’s drummer, as well as a composer and production guru. The 31-year-old here talks about musical experiments, why Hackney is still the place to be for artists and how space is “a blank canvas of imagination”. Channel the Spirits was written and recorded in Hackney. How has working in the borough shaped your music? I’ve been living in and around Hackney for about 10 years and I think there is a kind of edginess to the art that’s created here, though probably that was more so a few years back. People travel in from all round to go there and make stuff. I live further east now in Forest Gate but we all travel in because it’s still the place to get stuff done really. We’ve got a studio space in Stoke Newington in a place called the Total Refreshment Centre. It’s kind of our ‘HQ’, and is where we recorded the album. It used to be a Jamaican community centre I think but now it’s a recording and rehearsing space. They used to do a lot of parties and gigs there too and there’s lots of bands and artists going through there all the time so it’s part of a little scene really. How did the band form and what brings you guys together musically? And you recorded the album then and there? Yeah, without doing any more gigs really we just went into the studio to do something that became the album. At the beginning we didn’t even know it was going to be a band. We just started recording. So the album is really the beginning of the band, because the album and last year’s EP (Prophecy) were taken from the same sessions. Can you talk me through the making of the album? Me and Dan had already started producing our own sound in the studio using reel to reel recording and a lot of improvising. We were just perfecting this method when we met Shabaka so he just sort of walked into this process. We must have written and recorded the album in about six days, then Dan and I mixed it in my garden shed during the winter. We tend to write whilst mixing too so we added a lot of laser sounds and some recordings from space. We just tried to fill it with interesting sounds from start to finish basically. How surprised were you to receive a nomination for the Mercury Prize? We were doing a gig in Portugal when we heard about it. We had a vague idea something was going on, and then Shabaka got a phone call and went outside. We started joking saying maybe that’s the Mercury nomination – and it was. So we just went straight down to the beach and went swimming in the sea. It was a really nice day and there was a really amazing vibe. A lot of people are talking of The Comet is Coming and making comparisons with the world music pioneer Sun Ra. Do you think that’s fair? I think everyone would agree that Sun Ra sounds very different to what we do. But because he used space and themes of space and created a mythology for himself, he has been quite inspiring. As soon as we realised this was going to be a spacy project it suddenly opened our creativity to a new direction and everything made perfect sense. We were kind of freed from our own culture in a way and reimagining our whole world at this point. Another thing is that Sun Ra’s band, the Sun Ra Arkestra, is still going and Shabaka is actually a member of that group. So he’s had some guidance from those guys as well – there’s a personal connection on his part. 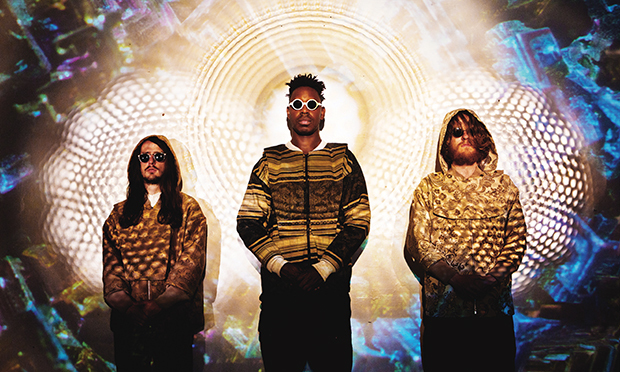 Shabaka Hutchings has said that the thing that unites you three is the “knowledge that we’re in space”. Could you talk a bit more about this and what it is about space and the cosmos that inspires you? Space is like a blank canvas of imagination really, because there are so many things that we don’t really understand or haven’t discovered. That’s kind of how our musical journey has been. The studio became our space mission, and it sounds cheesy but space taught us to use the equipment a bit like a science experiment. We’ve been trying to reconnect with music as a form of science. Science and music and spirituality at one point were all the same thing. They’ve branched out into different meanings, but I guess we’re trying to bring them back together and explore them and understand they were once just one idea. What’s you own musical background? I’m from a musical family – my parents are both musicians, so yeah I studied piano and met Dan at Sussex University where we both studied composition. But we got more into a beatnik kind of vibe and started going a bit more experimental. We all play in a lot of different bands around London because on a practical level it’s very healthy to be in a lot of bands because you get more experience, and also you have more work. As serial collaborators how do you rate London’s alternative jazz scene – is it in good health? Yeah, I’d say. Particularly in Hackney and parts of South London. But I think there’s a certain vibe of jazz music that has been collected within another scene. Basically there’s so much overlap of the genres that you’re starting to blur all the boundaries. I think in places like Hackney you can see that happen a lot, jazz musicians playing with non-jazz musicians. Are you going to carry on making music together as a three-piece? We’ve got another EP that we’ve already finished that will be coming out early next year, and there’s also been talks of maybe making a second album, which I think the label people are kind of keen on. But yeah, I’m sure we’ll try to continue making more experiments.